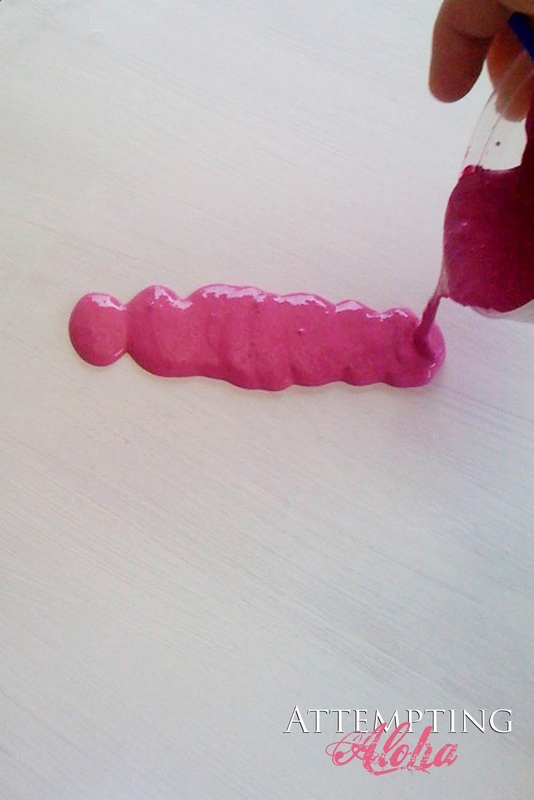 It’s time to link up YOUR 2011 Pantone Honeysuckle projects!! 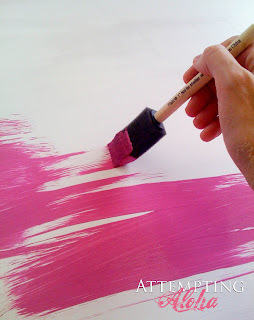 Today I’m going to teach you how to make your very own Honeysuckle chalkboard paint. FROM SCRATCH! Yep, I first learned the secret ingredient from the craft queen herself via her Martha Stewart Living Magazine. In their version, they used a flat paint like you would purchase in the paint section at a hardware store, but I really just wanted a smaller quantity to do a few Honeysuckle accents around my house and for Valentine’s gifts, so I thought I’d do some experimenting on my own with regular old acrylic craft paints and different proportions. 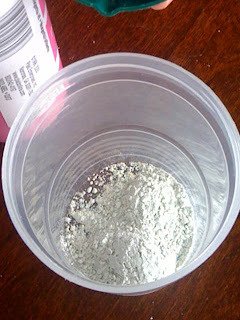 Step 1) Measure 1 1/2 teaspoons of the non-sanded grout and put in your mixing cup (this is very dusty, so please do this in a well-ventilated area). 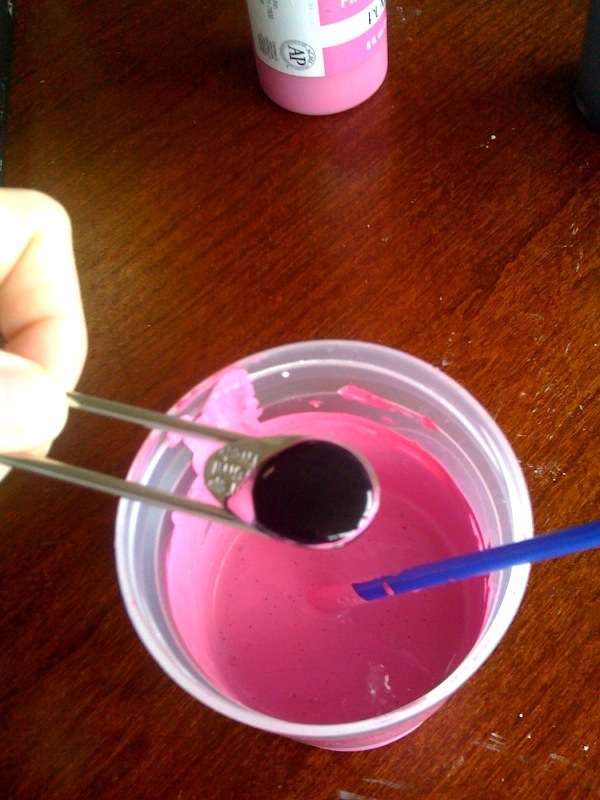 Step 2) Pour in 1/4 cup of the Pepto Bismol Bright Magenta craft paint. Step 3) Add 1 1/2 teaspoons of white acrylic craft paint. This next pic is to show you that the consistency WILL BE SLIGHTLY LUMPY still. The grout is very fine, so when you brush it on, it spreads right out and isn’t noticeable at all. I also used it on some cardboard cereal boxes and made chalkboard Chinese take-out boxes. I’ve been planning to do this for my daughter to take to school as gifts and was excited to have some Honeysuckle to use! This time I only did one layer, and I did not prime it. 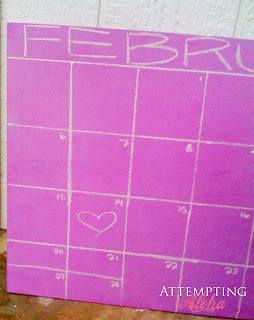 I just cut the box and painted directly on the inside with the chalkboard paint. 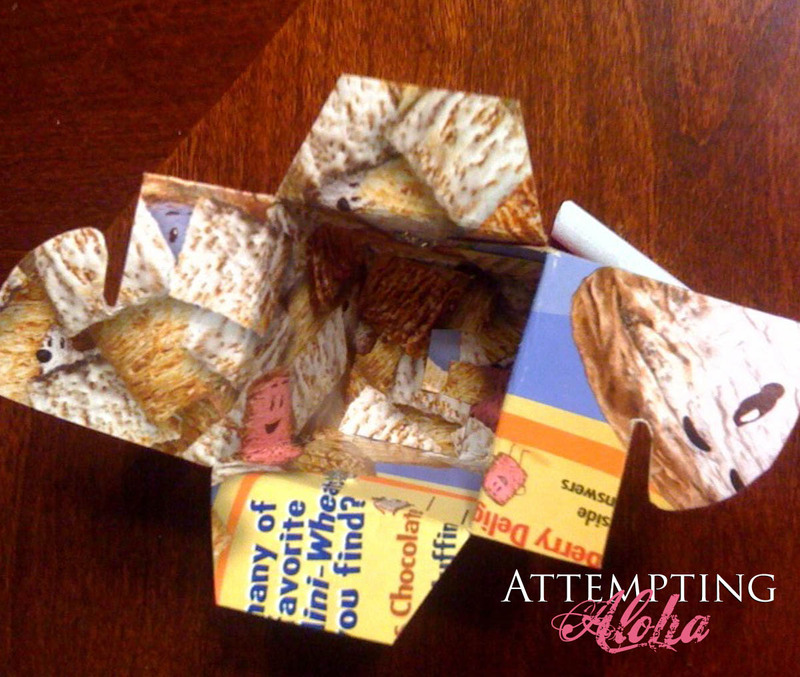 Then I used the Chinese take-out box pattern I designed (available as a free download on my blog) and cut it out. Just some color mixing advice, black is usually not the best color to use to darken another color as it can make it drab and dull. The best color to use to darken is the colors’ complimentary color on the color wheel. 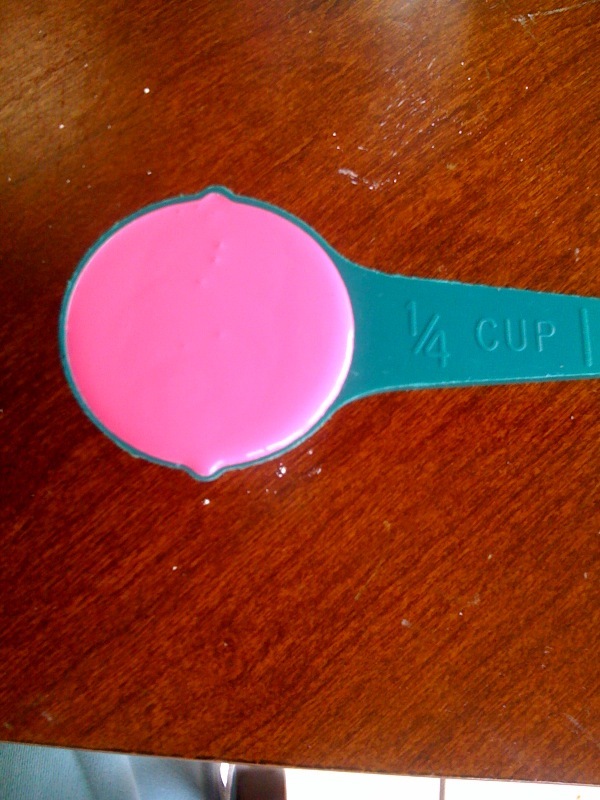 So for a pink color, you would want to add a little light green. For red, you would add green, and vice versa. For blue you would add a little orange. 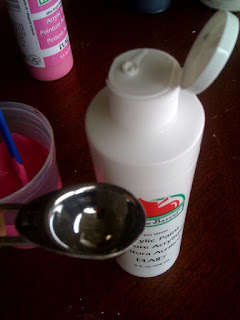 This will give you much richer color tones, and if you are trying for a nice rich black, mix equal parts of red and green. Hi! I tried this mix today -for which, by the way, thank you so much. 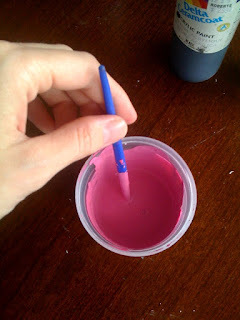 Love the fact that you can do pretty much any color you want- and it was easy, it looks great, it works and everything. The only thing is that after, as I read in other place, “slating it” (by “lightly rubbing chalk along the surface and then lightly rubbing it off”) the surface looks far too… cloudy, if you will, as in, the chalk left a VERY noticeable trace. I tried three different ways and the less grout I used, the better it looked, that is, more clean. Or perhaps the cloth I used to rub it off was a bit too damp? Still, do you know what’s the answer? 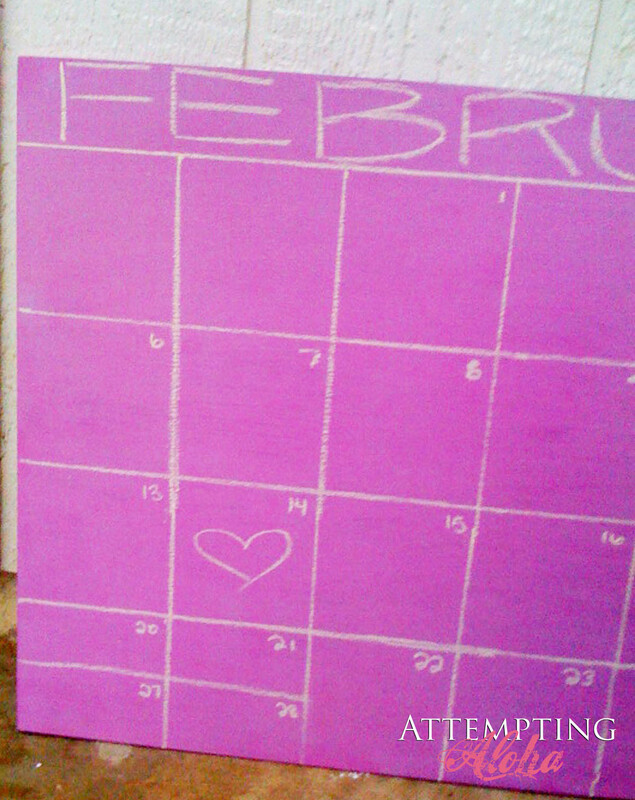 Because I’m afraid that using so much acrylic, when erasing the chalk, with time, the paint will peel off or something. Would love to have the total amount of acrylic paint used, for those that are not math minded, lol. I’m making a multi-purpose board and am going to have 1/2 of it be chalkboard so using all one color is going to be ideal. Can this be used on walls as well? Does the chalk erase well? Do you have to add the black and white with it? or can I just use the one solid color? if i like the color i am using already, should i still do this amount of paint? I was wondering if this chalk board paint is washable. I was thinking on using it on our white board considering we dont use it as what it is. Love this idea! I did a wall in both my daughter’s rooms–in black. Now I want to redo it in a prettier color! Thanks for sharing this! 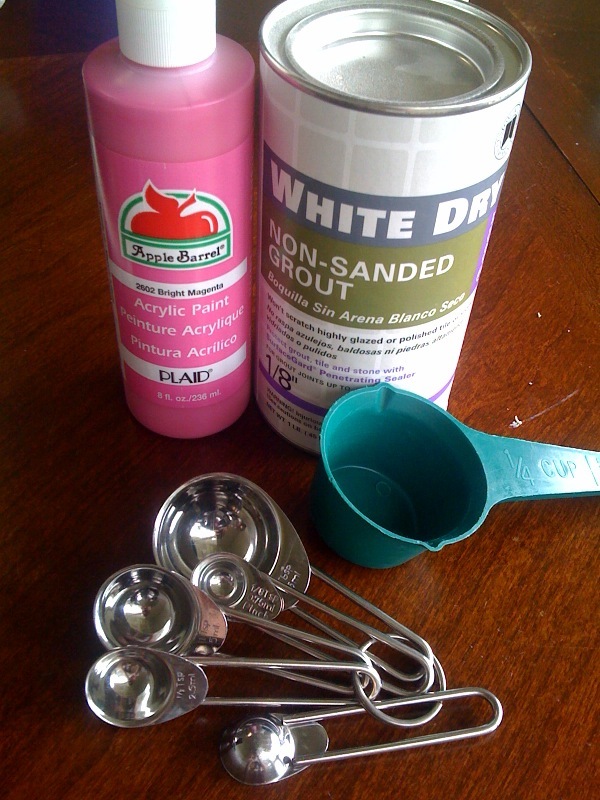 I mix 2 cups flat paint to 2 tablespoons un sanded grout and I blend it in an old blender… This makes it very smoot. Tempura paint has an egg white base which makes it dissolve in water. 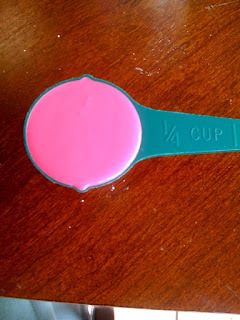 Next time use an acrylic paint. It has a plastic base so it will be permeant and water will be ok to use with it. It will also be a little thicker too, making it easier to have a nice finish on your final product. love the project. I use this method all the time. The only thing I do different is to premix the unsanded grout with a dash of water to make a paste before mixing it with the paint. It is nice and smooth and the little bit of water seems to help the paint spread better. Happy crafting!! Hi I loved your tutorial! 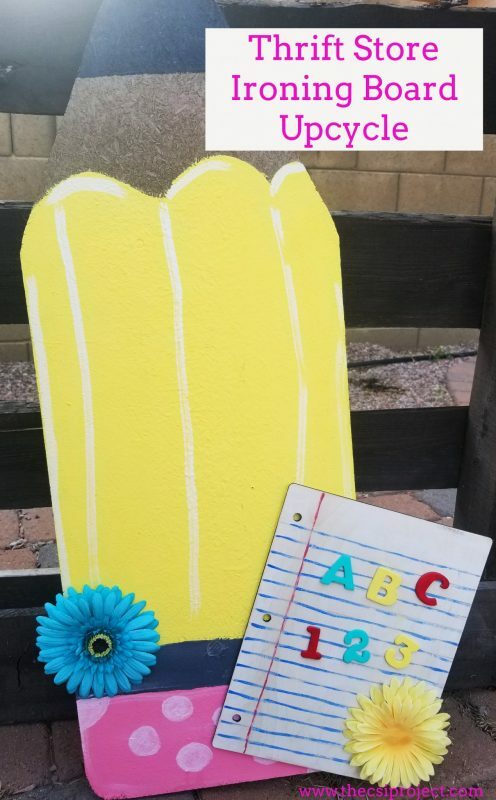 Do you know if this would hold up as an outdoor chalkboard? Now that I have converted all of my classroom chalkboards to whiteboards, I want to make this on the wall behind my desk! 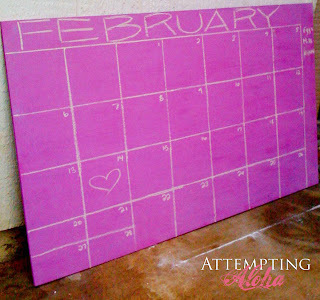 A little personal honeysuckle pink chalkboard:) Now, what did I do with all of that chalk????? 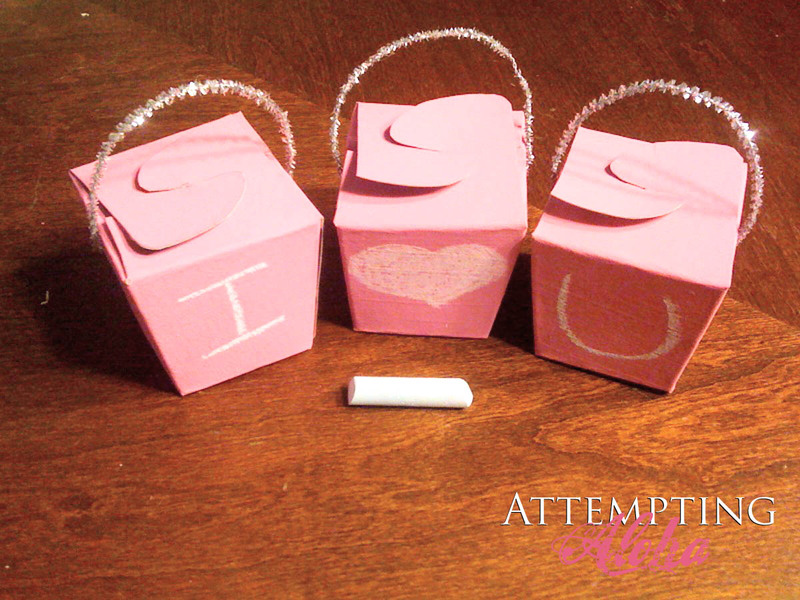 Thanks for sharing this easy, peasy craft! Finally, a fellow crafter on Oahu! Thanks, this is a great idea for my toddler.